This article is about the company. For its founder, see Joseph Cyril Bamford. For the credit card company, see JCB Co., Ltd.
JCB was founded by Joseph Cyril Bamford in October 1945 in Uttoxeter, Staffordshire, England. He rented a lock-up garage 3.7 by 4.6 m (12 by 15 ft). 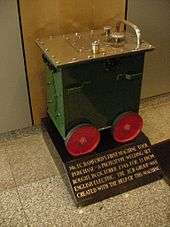 In it, using a welding set which he bought second-hand for £1 from English Electric, he made his first vehicle, a tipping trailer from war-surplus materials. The trailer's sides and floor were made from steel sheet that had been part of air-raid shelters. On the same day as his son Anthony was born, he sold the trailer at a nearby market for £45 (plus a part-exchanged farm cart) and at once made another trailer. At one time he made vehicles in Eckersley's coal yard in Uttoxeter. The first trailer and the welding set have been preserved. 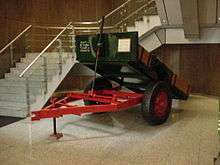 In 1948, six people were working for the company, and it made the first hydraulic tipping trailer in Europe. In 1950, it moved to an old cheese factory in Rocester, still employing six. A year later, he began painting his products yellow. In 1953, his first backhoe loader was launched, and the JCB logo appeared for the first time. It was designed by Derby Media and advertising designer Leslie Smith. In 1957, the firm launched the "hydra-digga", incorporating the excavator and the major loader as a single all-purpose tool useful for the agricultural and construction industries. In 1960, JCB's hydraulic tractors entered the North American market, proving a long-lasting success. JCB became, and still is, the brand leader in the world. By 1964, JCB had sold over 3,000 3C backhoe loaders. The next year, the first 360-degree excavator was introduced, the JCB 7. In 1978, the Loadall machine was introduced. 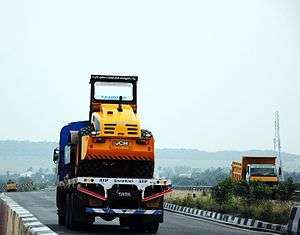 The next year, JCB started its operation in India. In 1991, the firm entered a joint venture with Sumitomo of Japan to produce excavators, which ended in 1998. Two years later, a JCB factory was completed in Pooler near Savannah, Georgia in the USA, and the next year a factory was opened in Brazil. JCB shed 2,000 jobs during the recession, but in 2010 it announced it was recruiting up to 200 new workers. The Company was a member of the business lobby group CBI until on the 11th of October 2016 it emerged on BBC news that JCB had left the group in the summer of 2016 following the Brexit vote. JCB has 18 factories in the UK, Germany, North and South America, Australia, India, and China. The company employs some 12,000 people on four continents and sells its products in 150 countries through 1500 dealer depot locations. The company has a range of more than 300 products. JCB is headquartered in Rocester, United Kingdom, which is also the production site for backhoe loaders and telescopic 'Loadall' handlers. It has a further three factories in nearby Cheadle, Staffordshire (JCB Earthmovers, JCB Landpower and JCB Compact Products), one in Rugeley (JCB Cab Systems), three in Uttoxeter (JCB Attachments, JCB Heavy Products and JCB World Parts Centre), one in Foston in Derbyshire (JCB Power Systems) and one in Wrexham in North Wales (JCB Drivetrain Systems). In July 2013 the company opened a dedicated logistics hub in Newcastle-Under-Lyme. This facility is the central hub for component distribution to production facilities, as distinct from the World Parts Centre in Uttoxeter which distributes spare parts to dealers and customers. Its Indian factories are based in Faridabad (Haryana), Jaipur and Pune, its US factory is in Pooler, Georgia, its Brazilian factory in Sorocaba, and its Chinese factory was completed in 2005 in Pudong near Shanghai. JCB also owns Vibromax, a German compaction equipment company based in Gatersleben. JCB has also licensed its name and image to a line of consumer power tools, manufactured by Alba PLC. The products are sold through franchised dealerships, many of which are often exclusive and cover whole countries. JCB dominates the Indian construction equipment market with every three out of every four construction equipment sold in India being a JCB. JCB India's revenue rose more than 12 times to $1 billion in 2012-13 from $75 million in 2001. The Indian operations of the UK company account for 17.5% of its total revenue. Many of the vehicles produced by JCB are variants of the backhoe loader, including tracked or wheeled variants, mini and large versions and other variations for carrying and moving items, for example fork lift vehicles and telescopic handlers for moving materials to the upper floors of a building site. Wheeled loading shovels and articulated dump trucks are also produced. Wheeled 360° excavators ranging from the JS130W to the JS200W. Machines can be produced with either monoboom or a triple articulated boom. Industrial and agricultural wheeled loaders from compact 6 tonne hydrostatic machines to larger 25 tonne quarrying machines using a mix of 4 and 6 cylinder diesel engines. JCB has also made its name in the tractor world by producing one of the first such machines that features proper suspension and is capable of travelling at speed on roads. The JCB Fastrac entered production in 1990. Prior to this design, the suspension was difficult because of the fixed-height connections required to farm machinery, and tractors were notoriously slow on the roads. Dependent on the model, the Fastrac can travel at 50 km/h, 65 km/h or 75 km/h (40 mph). At launch the Fastrac was featured on the BBC television programme Tomorrow's World, and years later as Jeremy Clarkson's tractor of choice in Top Gear. From 2006 the company also produces a range of compact tractors designed for grounds-care, horticultural, and light agricultural duties. JCB also makes a range of military vehicles, which also concentrate on load-handling and excavation. These include the JCB HMEE. In April 2006, JCB announced that they were developing a Diesel-powered Land Speed Record vehicle known as the 'JCB Dieselmax'. The car is powered by two modified JCB 444 diesel powerplants using a two-stage turbocharger to generate 750 bhp, one engine driving the front wheels and the other the rear wheels. On August 22, 2006 the Dieselmax, driven by Andy Green broke the diesel engine land speed record, attaining a speed of 328.767 mph (529 km/h). The following day, the record was again broken, this time with a speed of 350.092 mph (563.418 km/h). JCB acquired the German company Vibromax, which manufactures compaction equipment. JCB licenses its brand for a series of rugged feature phones and smartphones targeted at construction personnel. The design and marketing contract was awarded to Data Select in 2010. The JCB logo dates from 1953; from 1960 the company typewriters were given an extra key to render it accurately. The company has mainly advertised in the trade publications and their advertisements have won many awards, particularly for photography. The logo was designed by Leslie Smith, and is off-set at 18 degrees from the horizontal and 22 degrees from the vertical – the angles Joe Bamford liked. 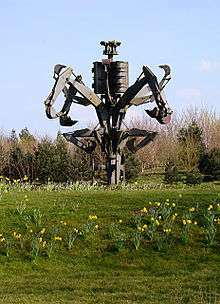 To demonstrate his faith in the hydraulic fail safes on JCB machines (which lock the arms in the event of a loss of hydraulic pressure, preventing them from crashing to the ground), Joe Cyril Bamford arranged to have several backhoes raise themselves up on their arms, and drove his car beneath them. This has since developed into a world-famous demonstration of the versatility of the backhoe configuration. The JCB display team (JCB Dancing Diggers) tour agricultural shows and produce videos, showing some of the unusual ways in which such vehicles can support themselves or manoeuvre. For example, it is quite common for drivers to support the vehicle on both buckets, either for turning on the spot without damaging ground, or for spinning the tracks in a puddle to clean them. The display team expanded this concept into a sort of vehicle gymnastics. The drivers are members of JCB's demonstration team, who visit prospective customers and demonstrate machines on the customer's property in order to prove the machine's suitability for the task at hand. JCB is the sponsor of JCB Academy, a new secondary school in Rocester which had its first intake of pupils in September 2010. In 1958 the singer Lenny Green had a song called JCB and Me. In UK version of the Teletubbies one of the live-action visual 5-minute segments (seen from a Teletubby belly) featured number counting involving vehicles in lines. A row of JCBs are seen in line, their hydraulics operated as if they are 'dancing'. JCB is prominently featured in the song entitled "JCB" by the music group Nizlopi, which has achieved UK Number One status. The song is about a boy who goes to work with his father for the day. A JCB (not talking) named Jekub appears in volume 2 (Diggers) of The Bromeliad (alias Nomes) series by Terry Pratchett. The Lego Technic range featured a scale-model of the JCB backhoe (Set 8862), complete with working hydraulics systems (simulated using pneumatics) and many other features of the original. 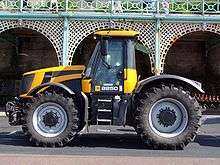 In series 9 of Top Gear, Jeremy Clarkson bought a JCB Fastrac 8250 for a challenge involving "growing your own petrol". Jeremy Clarkson, James May, and Richard Hammond all had to reverse their vehicles around the Top Gear car park. The song "McCavity"  by the UK group The Macc Lads contains the line "He's filled more holes than a JCB" to (rather crudely) demonstrate the sexual prowess of the band-member being sung about. One digger stars in the music video Sunday Morning – 1985 hit song by The Bolshoi. Three band members are standing on this 360-degree excavator while Trevor Tanner (the singer) is lying on the sofa. In the Popular ITV drama Primeval, JCB machines are used multiple times, sometimes to fight off prehistoric creatures. ↑ "JCB mit Rekordergebnis 2011". DEMCO JCB. 24 April 2012. Retrieved 24 April 2012. 1 2 "Company Information". J C Bamford Excavators Limited. Retrieved 27 September 2010. ↑ "JCB reaps reward for 'tough action' as profits show a rise". Yorkshire Post. 15 July 2010. Retrieved 18 August 2010. 1 2 "A Global Manufacturer". J C Bamford Excavators Limited. Retrieved 27 September 2010. ↑ Glancey, Jonathan (2007-04-20). "Classics of everyday design No 16". London: The Guardian. Retrieved 27 September 2010. ↑ Phillips, David (2001-03-05). "Obituary: Joseph Bamford | News". London: The Guardian. Retrieved 2009-09-15. ↑ "J C Bamford Excavators Ltd". Jcb.com. 2013-11-21. Retrieved 2016-06-15. ↑ JCB.COM news on JCB 444 engine Archived March 31, 2006, at the Wayback Machine. ↑ "Economic Times April 3, 2009". Economictimes.indiatimes.com. 2009-04-03. Retrieved 2009-09-15. 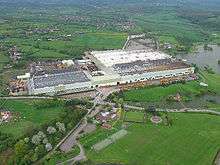 ↑ "Staffordshire-based JCB creates hundreds of new jobs". BBC. 2010-04-14. Retrieved 2010-04-29. ↑ "Company Information". JCB. Retrieved 2011-01-31. ↑ "Press Release". JCB. Retrieved 2013-12-09. ↑ "JCB India to set up Rs 500 cr facility at Mahindra World City". The Hindu Business Line. Retrieved 2013-12-09. ↑ "JCB perfects the art of manufacturing in India". Livemint. 2014-09-25. Retrieved 2016-06-15. ↑ "BATTLESPACE - In this issue". Retrieved 2011-01-05. ↑ Garwood, Michael. "Data Select set to lose JCB exclusive?". Mobile News. Retrieved 2013-07-27. ↑ "JCB Insurance improves Plantmaster policy". Theconstructionindex.co.uk. 2012-09-19. Retrieved 2016-06-15. ↑ "JCB launches insurance website | News". Vertikal.net. 2012-01-16. Retrieved 2016-06-15. ↑ Jamie Doward (14 November 2010). "Feud between Bamford brothers threatens to cast light on funding for Tories". Guardian newspapers. Retrieved 9 March 2015. ↑ "The Macc Lads". The Macc Lads. Retrieved 2009-09-15. Wikimedia Commons has media related to JCB.